Education is crucial for the proper functioning of a democracy. Why? Because, runs the usual argument, if the people are to be entrusted with deliberating and making decisions for the common good, they must have the intellectual wherewithal to deliberate and decide effectively, and this comes from education. This is true and important, and it has the consequence that a democratic education must be as broad and encompassing as the considerations which the citizens of a democracy might conceivably be called upon to deliberate. These considerations will necessarily be many. But I have thought that there is another reason why education is important to democracy, and one that stresses the importance of a specifically humanistic education. A democracy must be capable of producing leaders capable of contributing wise counsel to public deliberations, and of adopting the right course of action. The leader of a healthy democracy suffers from several disadvantages that a king or emperor does not: First, she must obtain her office, usually through some mixture of persuasion and (one hopes) demonstrated ability. Second, she does not have the luxury of resorting to naked force to get people to do her bidding, as her sphere of legitimate action is circumscribed by laws. Third, the powers granted to her by the people’s sufferance are held only for a limited period of time and during good behaviour. With frequent elections comes frequent singing for one’s supper. Thus, however judicious are the views of a democratic leader, she will get nowhere without considerable powers of persuasion. (Remember, I am talking about the leader of a healthy democracy. Ours is not healthy, and our leaders only need “persuade” a small cadre of followers, and such persuasion most effectively takes the form of rewards and punishments.) Such leaders are best produced through a liberal education. Of course, it would be nice if such a leader had a solid grounding in other areas of expertise, but a liberal education can provide a leader with the resources to see the bigger picture, as well as to inspire, persuade, and motivate. To do this, a leader must have the ability to articulate the values and aspirations of the people’s better natures, and to provide fuel for their sparks of better hope. This is best gained through the sort of sensitivity to language and the access to the power of rhetoric that a liberal education can provide. And yes, I say “rhetoric” — only a culture as debased as ours is incapable of seeing value in rhetoric. I don’t think I’m stepping too far out on a limb when I say that, however qualified they may be in other ways, today’s leaders are a less-than-inspiring lot. And I also think I’m not too far off the mark in saying that a contributing cause in this leadership decline is a lack of real liberal education among our leaders, amongst whom we have many lawyers, economists, and bankers, but very few humans. Read through something like the US Declaration of Independence and tell me there is a leader in office in any of the affluent democracies that is capable of producing such a document today. It is my opinion that Barack Obama is such an inspiring public speaker largely because he exists in an age of rhetorical Neanderthals. As the saying goes, in the kingdom of the blind, the one-eyed man is king. Mr. Obama has an admirable delivery, but his speeches are, it must be admitted, pretty vapid in terms of form and content. Thomas Jefferson, for all his many faults, was a master of the rhetorical arts. 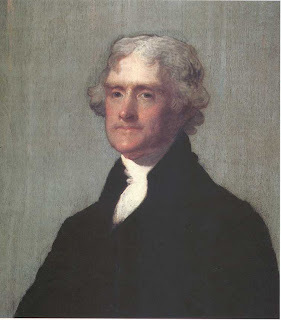 What’s more, although the first draft of the Declaration was Jefferson’s work, it was the responsibility of a “Committee of Five”, and this committee made improvements upon his work. Through a system of liberal education that was second to none at the time (except perhaps for Scotland’s), the early American Republic found itself with an embarrassing abundance of top-notch leadership, men who were great in their generation. To fully absorb Jefferson’s genius here, a consideration of the context is required. The American colonists were proposing to do the unthinkable: to reject the authority of their lawful king, the representative of a divinely instituted monarchy, and to take up arms against him. Second, although it’s easy to forget now, the Americans themselves were very divided about this. It is estimated that 15-20% of the population of the American colonies at this point remained loyal to the Crown. Many of these would say that the revolutionaries were proposing to violate the natural order. Furthermore, I have no doubt that, depending on how you define “loyalist”, this figure is an underestimation. For example, until well into the Revolution, there were many who, although they identified with the rights of the colonists, nevertheless hoped for reconciliation with the mother country and who, needless to say, maintained some inner doubts about the legitimacy of their actions. After all, not everyone has the stomach for a revolution, however aggrieved they might feel themselves. Then as now, politics was complicated. We should not be too eager to accept the conventional view of the period as it was constructed later. Thus, instead of immediately making high-flown assertions of the rights of the colonists and their liberty, Jefferson chooses to address himself to those, both at home and in Britain, who are uncomfortable with revolution. Instead of playing up the notion of liberty, Jefferson’s language is highly necessitarian. He does not immediately launch into a justification of why the colonists ought to separate from Britain. Rather, he chooses to insist that the colonists must do so. It is the same move as Martin Luther made when at the Diet of Worms he famously said “Here I stand; I can do no other.” Here are the examples of necessitarianism contained in the opening sentence of the Declaration of Independence. There is a double dose of necessitarianism here. First, there is reference to the course of human events, which the educated part of his audience would be immediately able to connect with its Latin root cursus, which to the Romans was a racetrack. When running a race, one of course does not stray from the course (pardon the instructive pun). It is already laid out. One may only follow along it as fast as one can. Second, there is the reference to human events, which is interesting mainly because Jefferson chose not to say “human deeds” or “human actions” or "human affairs", which would have smelled too much of voluntarism. Deeds and actions are things one does, usually voluntarily; events are things that happen of themselves, whatever might be one’s intentions. In other words, the conditions that make it necessary for the Americans to dissolve the political bands which have connected them with Great Britain are brought about by impersonal and disembodied events, not by the choices, actions, or whims of the colonists themselves. Again, there is a another double dose of necessitarianism packed into this tiny phrase. Although this is a nice example of Jefferson’s Deism (after all, he could simply have said “to which God entitles them”), more important for our purposes is that the reference to laws of nature has a physicalist and deterministic feel to it. His audience would have naturally thought of Newton’s laws of gravity as examples. One does not – because one quite literally cannot – disobey the physical laws of nature. But the reference to “Nature’s God” brings a theological necessity to bear upon his audience as well. Both Deists (or atheists) and conventional religious believers are being appealed to here, and at the same time. His choice of verb here is strikingly necessitarian. Instead of “requires” he could have used any number of other words: “asks”, “requests”, “entreats”, “begs”. Indeed, this last word would have its own peculiar rhetorical force in the sentence, but not quite of the kind Jefferson seems to have been looking for. When your boss requires you to work overtime, it is not in your power to effectively refuse. But if he begs you to work overtime, you are in a stronger bargaining position. In this case, respect for the opinions of mankind requires that the colonists explain themselves; hence the need for the Declaration. This phrasing is straightforwardly necessitarian, in the most concrete and physical sense. “Impel” comes from the Latin impellere, “to strike against; to set in motion”. We might almost picture to ourselves a pool table with racked billiard balls. An external and irresistible force (the cue ball) acting upon passive objects, forcing them to separate and go their different ways. Again, the Americans are forced (literally) into independence; they can do no other. I find in reading the Founding Fathers that each seemed to have his own talent. Washington is striking for his integrity and perseverence, and his singular ability to command the respect of nearly everyone. Madison was probably the deepest political thinker among them. But Jefferson was certainly the best writer (with Hamilton a close second). It is rather disappointing to discover that a man who is so famous for his stirring political prose was not a confident public speaker.